Creating ID Cards for employees in a large organization will be a tedious task.Individually selecting facial portion from Images can take a lot of time.Face Crop Jet can automate this task for you by automatically detecting and cropping out the facial portion from these images. 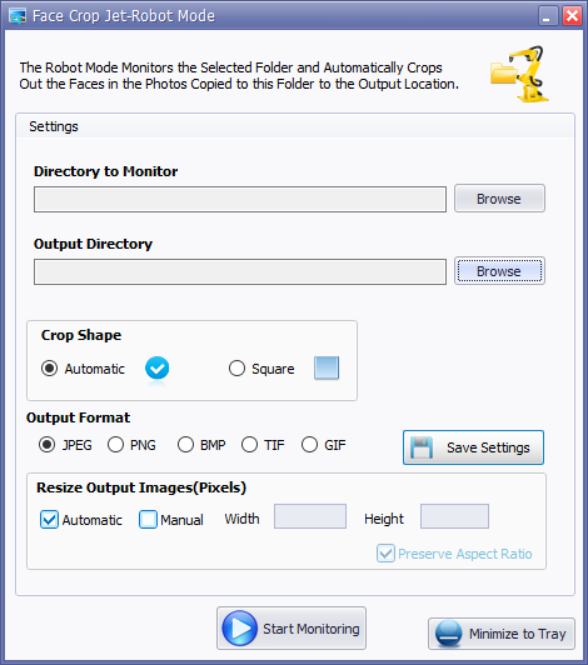 To makes things even simpler for you, we have introduced a new Feature called the Robot Mode/Directory Monitor.The Robot Module of Face Crop Jet will Monitor a Folder you select and automatically crop out the faces copied to this folder. Once a Directory to monitor has been set,Face Crop Jet will start looking for faces in Photos Copied to this folder.The Detected Faces will be saved to the selected output location. You can minimize this window to the tray, so that the process is performed in the background without taking up desktop space. You can use this feature to automate processes like creation of Identity Cards for Employees.Take a look the Demo Video that features the Robot Mode of Face Crop Jet.